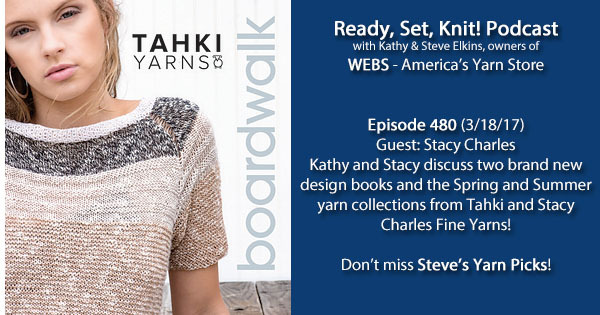 This week, Kathy talks with Stacy Charles of Stacy Charles Fine Yarns and Tahki Yarns. 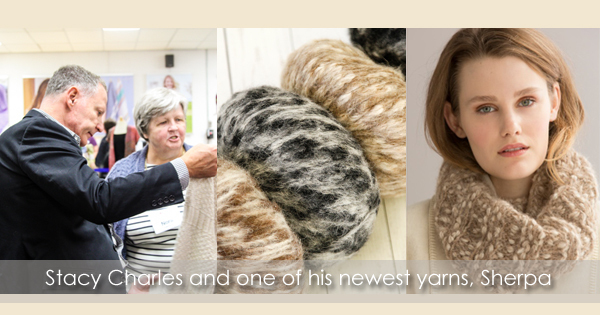 Stacy Charles has really upped the game this spring with four gorgeous yarns – three in the Tahki line and one for Stacy Charles Fine Yarns. Plus, with two new design books Stacy Charles One Christopher and Tahki Boardwalk, filled with chic patterns using Tahki and Stacy Charles Fine Yarns in breathable plant-based fibers, you’ll want to knit an entirely new wardrobe for the warmer months! Check out Tahki Catalina, Skinny Jeans, Baja, and Stacy Charles Lia. Frabjous Fibers Lamb’s Tail First Bloom – WEBS exclusive colorway! WEBS is having a Rhinebeck Sweater KAL! The kickoff event is Saturday, March 25th in the store form 1-4. Click here for more information and to register! 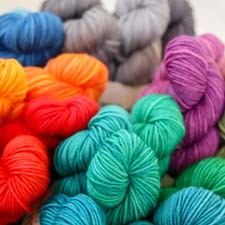 Visit WEBS at the DFW Fiber Fest from April 7-9! WEBS will be at Stitches United in Hartford, Connecticut from April 27th-30th. We’ll be at booths 407, 409, 411, 506, 508, 510. For a map of the marketplace floor, click here! Already planning on going to Stitches United? WEBS has a coupon for 50% off market admission! Guest: Stacy Charles of Tahki Stacy Charles Yarn talks to Kathy about new spring products. Tahki Stacy Charles is made up of Tahki Yarns, Stacy Charles Collezione, and Filatura di Crosa. In this week’s podcast, Kathy and Stacy chat about Tahki. Tahki Yarns are first and foremost natural fibers. They also chat a little bit about the cost limitations of natural dyes and more. Note: There will be no podcast next week.